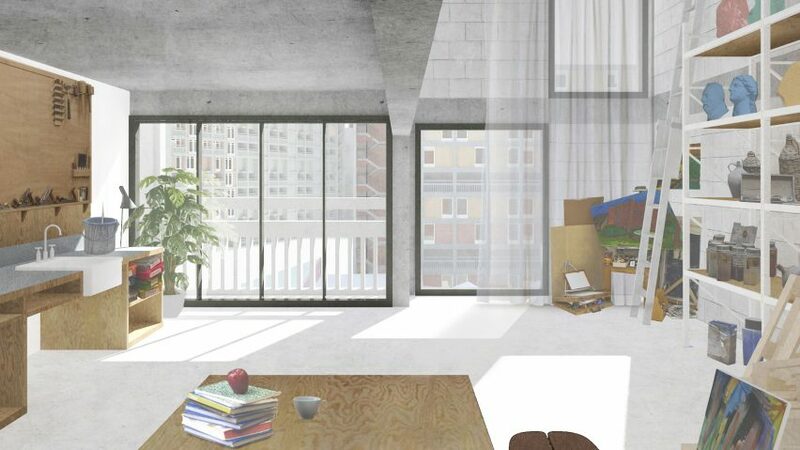 Park Hill estate is to receive a new Carmody Groarke-designed art gallery and suite of studios, as part of the redevelopment of the brutalist housing scheme built in 1961. Carmody Groarke's plans for the Park Hill Art Space will see the conversion of a 7,200-square-metre block at the Grade II*-listed Park Hill estate into live/work artists' studios and a purpose-built gallery. The art centre will also provide space for a research institute, heritage archive, learning spaces, an auditorium, workshops, a cafe and shop. A 2.5-hectare sculpture park will also adjoin the space. The London studio founded by Andy Groarke and Kevin Carmody saw off competition from five other high-profile practices vying for the project: Caruso St John, 6a Architects, Architecture 00, David Kohn Architects and Dow Jones Architects. The competition was launched by S1 Artspace, an arts organisation based at Park Hill estate. "Making S1 Artspace an integral part of the future of Park Hill will be hugely important for the growth of the arts and the cultural economy of Sheffield, and will safeguard the listed buildings' future with creative transformation," said Carmody Groarke co-founder Andy Groarke. "The brutalist concrete frame of the existing building will be pared back and carefully refurbished to enable the largest, most flexible spaces for the production of art," said the studio. "Public realm at ground floor level will clarify new public routes connecting Park Hill to the city centre and make legible entrances and public spaces within the arts venue." Carmody Groarke was selected by a panel that included the organisation's artistic director Louise Hutchinson, and Jonathan Falkingham, the creative director of Urban Splash – the property developer behind the estate's current regeneration. "We are delighted to be working with Carmody Groarke to transform our vision for Park Hill Art Space into a design that we hope will capture the imagination of audiences both locally and nationally," said Hutchinson. Urban Splash is currently working with the architectural practice Mikhail Riches on the second wave of development at the estate, which will see modern homes inserted within its famous exposed concrete structure. This first stage of the estate's renovation was overseen by architects Hawkins\Brown and urban designers Studio Egret West, and completed in 2013. The 1,000-apartment estate was originally designed by Sheffield council architects Ivor Smith and Jack Lynn to house families relocated as part of Sheffield's post-war slum clearances. Whole neighbourhoods were stacked vertically in the estate's "streets in the sky" – broad access decks that aimed to recreate the social atmosphere of terraced streets above ground. But by the 1980s, council neglect and design flaws saw Park Hill labelled a "sink estate" in need of redevelopment.